Tosca Cafe in San Francisco's North Beach neighborhood opened in Fall 2013. Renovations to the now nearly 100-year-old space honor the charm and character maintained by former owner Jeannette Etheredge. In the kitchen, CDC Andrew Naffziger works to craft an Italian-inspired menu informed by the rhythm of the seasons and unparalleled Bay Area produce. . 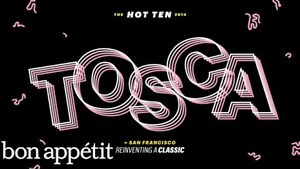 Given Tosca’s history as a bar, cocktails are a focus with classic and seasonal offerings, as well as an homage to Tosca's famous house cappuccino, a holdover from Prohibition times made with chocolate, steamed milk and a shot of brandy. An impressive wine list spotlights Italian varietals and new and old school California vintages. Since opening, Tosca has garnered critical acclaim from The New York Times and The San Francisco Chronicle, where it was awarded three glowing stars in May 2014 and, again, in July 2016. Tosca was also recognized as one of Bon Appétit and Esquire magazines’ top ten best new restaurants in 2014.